Longing for the Northern Hemisphere winter and alpine snow season? Winter is here! And with that Melbourne brings its newly famous Winter Festival to a place near you. 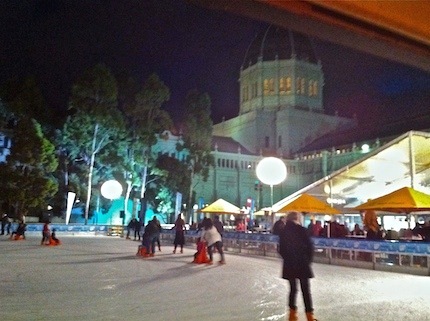 This year, St Kilda is hosting the festival with largest outdoor ice-rink in the southern hemisphere. 2011 being the first year of the festival, it attracted around 30,000 visitors at each location. There is an Alpine Ski Hut with cosy wood fires, international food and entertainment bringing you the flair of Scandinavian seaside towns, Alpine villages of Switzerland and Austria, the ski fields of France and Italy, and snow-laden cities of Russia and beyond - filling the air with a sensuous feel of the European Winter. Bratwurst, goulash, Schnapps, lederhosen, slap dance and Bavarian Ooompah pah band - what more can you ask to be taken to the European winter and good old times. Or what about Poffertjes (Dutch small fluffy pancakes), French Crepes, Swiss Raclette (melted cheese dish), Hot Chocolate, Pretzels, Gluhwein (warm spiced red wine), German Bier, authentic pasta and pizza, and Swedish Meat Balls? Or there is the St Moritz Bar with European DJs and Apres Ski entertainment at night for something more modern. Relax, warm your feet and enjoy the nightly music program. The festival itself is free and includes skating performances by the greats of Ice Skating Australia. You can purchase food and drink. You have to purchase tickets for the ice rink though. Tickets are selling fast, best to book session tickets online. They range between $10 and $30 for 45-minute sessions during the afternoon and evenings. You can even take Ice Skating lessons and learn a move or two yourself. Winter Wonderland Party - Saturday 7th July - Dress in something that reminds you of winter and hit the rink!